It has been some time since I talk about some products that I have been trying out. Today I am going to share with you a skincare set that has done well to my skin. What attracts me is that it is formulated with Habbatus Sauda & Olive Oil. To my sisters out there, you know how Habbatus Sauda can really provide amazing benefits to us. Habbatus Sauda has anti-inflammatory benefits and has been used 3,300 years ago. So you know how this amazing ingredient has been used before we even know it. Ardini Essentials offers you 2 essentials that you need in your skin care routine. The Deep Facial Cleanser & The Facial Treatment Serum. After removing my makeup (during the night), I will use this cleanser. It foams up pretty nicely and has a nice refreshing scent. The microbeads contain in this cleanser does not leave any excessive roughness feeling while scrubbing, it feels just nice. my skin also does not feels dry after using this. Although this cleanser foams up a bit, it is not formulated with sodium lauryl sulfate (SLS). After cleanse using the Deep Facial Cleanser, & tone my skin, I use this Facial Treatment Serum. Comes in a pump bottle, and all you need is 2-3 pumps only. 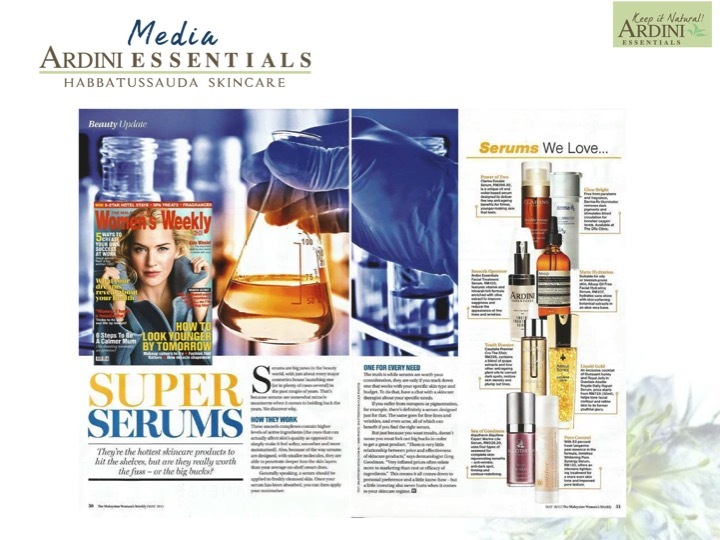 This serum has concentrated formula of Habatus Sauda. It also has antibacterial properties, which means also prevent from acne. This serum has a gel like texture, at first for me it feels a bit sticky but just in seconds, it absorbs and leaves my skin feels so soft! Below show the texture of the Deep Facial Cleanser & Facial Treatment Serum. The Serum has a slightly thick texture to my opinion, absorb to a matte finish on the skin without the sticky feeling. The Deep Facial Cleanser has fine microbeads that help to gently exfoliate your skin gently daily. It foams up nicely too while using it. Here is a before & after picture of my skin. I consistently use the Deep Facial Cleanser & Facial Treatment Serum throughout this 14 days. My main skin problem for the past few weeks are enlarged pores, whiteheads, and redness. I found that my pores are reduced, and my red spots have also healed. The dryness of my skin can still be seen but I find that my skin feels much softer after using the serum. Overall, I find that the star ingredient of this skincare really makes a different. I'm really satisfied with it! 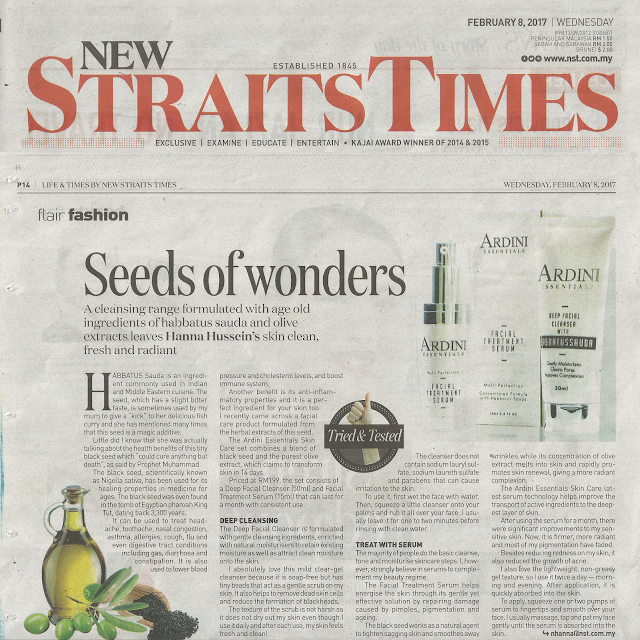 All Ardini Essentials Skincare are natural and free from Sodium Lauryl Sulfate (SLS) / Sodium Laureth Sulfate (SLES) & PARABEN. Suitable for both men & women, all skin types especially sensitive skin. This set retails for RM199.00 and you will get 50ml of Deep Facial Cleanser & 15ml of Facial Treatment Serum. Minta beri cadangan. Apa yang perlu saya pakai (brand product) bagi gelap bawah mata saya serta muka kulit saya kelihatan ton clour tak sama (kerna jemuran matahari maybe). Saya tak tahu nak pilih memandangkan diluar sana terlampau banyak product trjual. Ardini essentials vs cetaphil..which one is better?